"Think homemade mozzarella cheese is impossible to make? Think again! This recipe shows you how to make delicious mozzarella cheese from scratch. You can create any shape you desire - try larger balls, small balls, or twists and knots. Store in the refrigerator." Combine 1/4 cup water and rennet in a small bowl; mix well. Combine remaining 1/2 cup water and citric acid in another small bowl; mix until dissolved. Pour milk into a large pot set over medium heat. Stir in water-citric acid mixture. Heat milk, stirring occasionally, until it registers 90 degrees F (32 degrees C) on an instant-read thermometer, about 5 minutes. Remove milk from heat and stir in rennet mixture in a figure-8 motion for 30 seconds. Stir counterclockwise for 30 seconds to still the milk. Let stand, covered, until milk sets into curd, 5 to 10 minutes. Press edge of the curd gently with a palette knife or the back of a spoon to check for firmness. Slice vertically into the pot to cut curd into 3/4-inch cubes with a palette knife. Stir curds gently, but leave cubes mostly intact. Return pot to the heat; cook over medium heat, stirring curds gently, until temperature reaches 109 degrees F (43 degrees C), about 5 minutes. Remove from heat. Ladle curds into a colander set over a large bowl using a slotted spoon. Press curds gently to extract liquid whey. Pour drained whey back into the pot. Heat whey to 185 degrees F (85 degrees C), about 5 minutes. Wearing gloves, tear off a piece of curd and place on a slotted spoon. Dip curd into hot whey for 5 to 10 seconds. Stretch, fold, and knead the curd. Repeat until mozzarella is smooth and elastic. Knead in salt and form curd into a ball. Repeat dipping and kneading process with remaining curd. Allow mozzarella to cool. Wrap tightly in plastic wrap and transfer to the refrigerator. 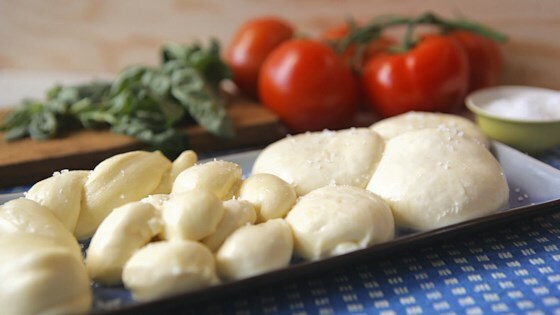 Watch how to make mozzarella cheese at home! Do not use ultra-high temperature processed (UHT) milk. Regular pasteurized milk will work, but raw milk is best. At the end of step 7, you may place your curds in a plastic bag and store both the curds and the whey in the refrigerator for 2 to 3 days before continuing the process. If you want a softer-textured, moist mozzarella, do not let the curd get as firm and work less when stretching and kneading. Speed up the cooling process in step 9 by placing mozzarella balls in an ice-water bath. Tastes fine. Wish I would have read the reviews before I tried to make it. I would have realized that it forgot to mention when to add the citric acid mixture and how much renet to use.